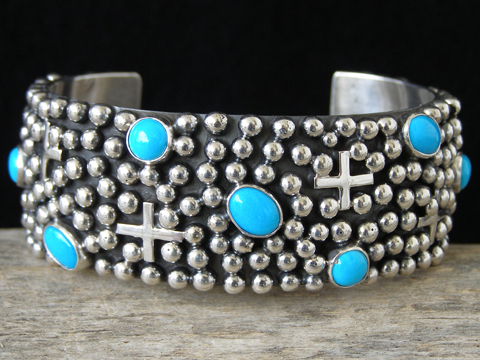 Ronnie Willie Sleeping Beauty Turquoise Four Directions Cross Bracelet size 6 1/4"
Navajo silversmith Ronnie Willie is a new artist to our website in 2011. He does come well-introduced, however, by his brother Rudy Willie (who smiths with his wife Happy Piasso) whose work we've carried for some years. This is a great design with five ovals and four rounds of clear blue natural, untreated Sleeping Beauty turquoise from Arizona set diagonally across the face of the bracelet. This cuff is heavily oxidized to make the background black, while shiny Four Directions cross appliquées and raindrops stud the surface of this cuff giving it wonderful texture and a solid, hefty feel. Hallmarked Ronnie Willie with an arrowhead between his two names and stamped Sterling inside.